I must admit that I feel a bit awkward writing this, since a) it's my first review EVER, and b) I'm not really used to the world of cosmetics, where I've been introduced by my lovely girlfriend Jessica, which, apart from being my life saver (essentially, suggesting me that I should stop using that discount priced shampoo from 1997) is the co-author of this blog. 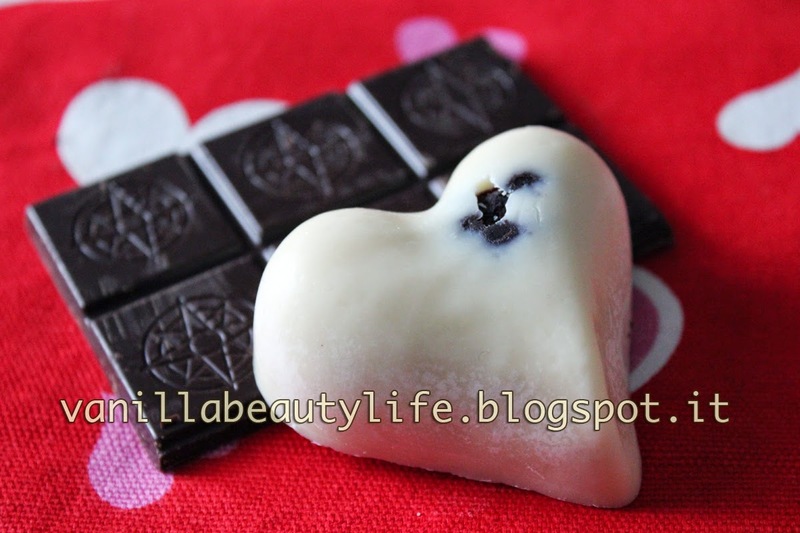 The consistency of this little vanilla coloured heart with brown spots is quite pleasant. It is pretty firm; at first you may actually think it's a small bar of soap. The scent is extremely delicate, definitely natural, there isn't a trace of those spiky or acre perfumes that immediately lead your thought to something chemical. Lush's web site states that it is entirely made of natural butters and oils – yep, I can tell it's really true! My favourite thing about Soft Coeur is that it seems perfectly engineered to melt at body temperature; and it takes the right amount of time to soften after you've picked it up, which is a very positive thing, both for your hands and the body you're massaging: I'd hate to have something that gets squishy and messy after two seconds. In this case, you have to rub it a little before it gets smooth enough to run perfectly, especially on a dry skin. It's a very pleasant sensation for the masseur too, since the hands don't barely get as oily as they do when you use a “classic”, liquid oil. I just wish it could last a bit more, since it's not as cheap as a packet of crisps, and after two massages (about twenty minutes long) it's almost gone. Besides that, the only thing that could be improved – even though it's one of the main features, and I guess it's just a matter of taste – is the chocolate-made centre, which weakens the structure of the heart, making the last part nearly impossible to use. One moment, you're thinking: “Yay! There's still quite a long way to go!” and a few seconds after, what's left collapses in your hands. It's a bit disappointing, I'd really prefer something that I can run till the very last part dissolves.